Music selection is "Judge Not!" from his Mary of Egypt oratorio. Without the collaboration of Mother Thekla, 'Mary of Egypt' could never have been written. I wanted to know the Theology of the Desert in all its searing compassion, but I also wanted an almost childlike text not unlike early Coptic ikons. 'Mary of Egypt' stands or falls by the recognition of the shock of its simplicity both in music and text. The music reflects this simplicity in the incredibly tight use of material. The subject of Mary of Egypt had long haunted me - the story of an early Christian harlot and saint and the meeting with a holy man in the desert. 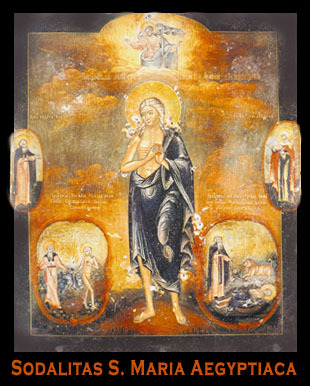 How could one call the whore Mary of Egypt 'good' even though she never took money for her prostitution? How could one question the holy man Zossima at all? Precisely because Mary's door was wide open, even though her love was misdirected and distorted, and Zossima's door was closing around him with his pride, 'even though he understood all mysteries,' he had not found 'the one thing needful' - the supreme mystery, the humility essential for love. We see the two figures, ikon-like, in parallel lines: Mary whoring without singing words in Alexandria and Zossima verbose and 'stuck' in his world of so-called holiness, with the help of a small group of singing and acting women and men representing the extensions of Mary and Zossima respectively and 'the Voice' unseen and unembodied. Zossima's whole sound world becomes Mary's. In her he sees 'love' and his own limitations. His world, once so dry, now in the dryness of the desert, flowers into what the Desert Fathers might have called 'Uncreated Eros' or a hint of the Edenic state. In controlled ecstasy, they both ask for each other to give the blessing. Then Mary levitates as the angels lift her up. Zossima, terrified and awestruck, cannot leave her - 'if only I may just look on you forever...' - but Mary sternly makes confession of her former life and then tells Zossima to leave her and return in a year to give her what she most desires - 'the Body and Blood of our Christ'. Then in a series of mimed insets, Zossima mimes his grief as he comes looking again for Mary; then in despair he sees her over the other side of the water. How can she cross? She walks over the water, receives communion and tells desolate Zossima to go away and return again the following year while she returns, walking on the water. A year elapses and Zossima comes again. This time he cannot find her anywhere. Then suddenly he sees her lying dead in the sand with an instruction marked into it - 'bury humble Mary'. Redeemed nature appears and a lion, tame in the presence of the remains of the saint, helps feeble Zossima to bury 'humble Mary' with his 'busy paws'. The whole piece is loosely based on the ancient Byzantine hymn 'Awed by thy Beauty' sung to the Theotokos, the Mother of God. In a sense, Zossima loves again when through Mary he can dimly see the beauty of God - and who knows how far Mary has gone in her search for the unknowable and unobtainable in her forty solitary years in the desert? Holy Mary of Egypt, pray to God for us. Sir John Tavener (b. 1944) is a British composer. His work is heavily influenced by the theology of the Orthodox Church and the Church's liturgical traditions. Click here for a selection of his music available at amazon.com. The entire opera is also available for purchase from private parties. Entire site © 2012 Sodalitas SMaria Ægyptiaca Inc.